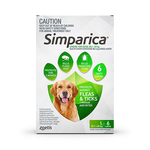 Simparica is the simplest solution to all your flea and tick problems! These great tasting chewable tablets have a brilliant track record of success, starting to kill fleas in approximately 3 hours and preventing reinfestation of fleas and ticks for up to 35 days, from day one. 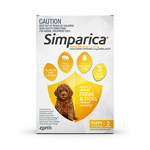 That's right: when given orally once a month, Simparica travels in your dog's blood to safely deliver persistent and continuous protection against fleas and ticks from day one, to day 35. This means that, if you forget your dog's medication for a few days the following month (30 days later), they'll still be covered by the power of Simparica for an extra five days. That's a relief! 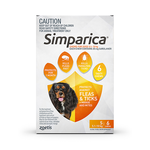 Simparica comes with a number of other benefits as well, such as rapid relief for pets with existing flea infestations. Dogs with flea allergies have also shown significant improvement with Simparica, which also prevents and controls infestations in your home, killing fleas before they can lay eggs. Furthermore, Simparica also cleans up mange and mites, providing relief and reducing the chance of skin irritation and risk of infection from ear and demodex mites. 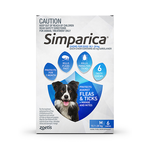 Against its leading competitors, Simparica had a fast 99.7% flea kill versus a slower uptake of 87% flea kill - a significant difference! As for ticks, Simparica killed 99% of ticks compared to their closest competitor, who managed a 64.6% tick kill. That's not bad. Not bad at all! 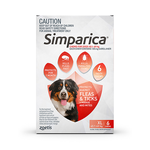 At Pet Circle, we carry a wide range of Simparica medications for large dogs, small dogs, puppies, extra large dogs and medium dogs - you can also enjoy the convenience of free delivery over $29 straight to your door, always at the best price with our price match guarantee. Please see individual products for a listing of ingredients as well as dosing guidelines, to make sure your dog is receiving the correct coverage for their breed and lifestyle.